Identifieds the ephemeral Orange River Sovereignty in South Africa. 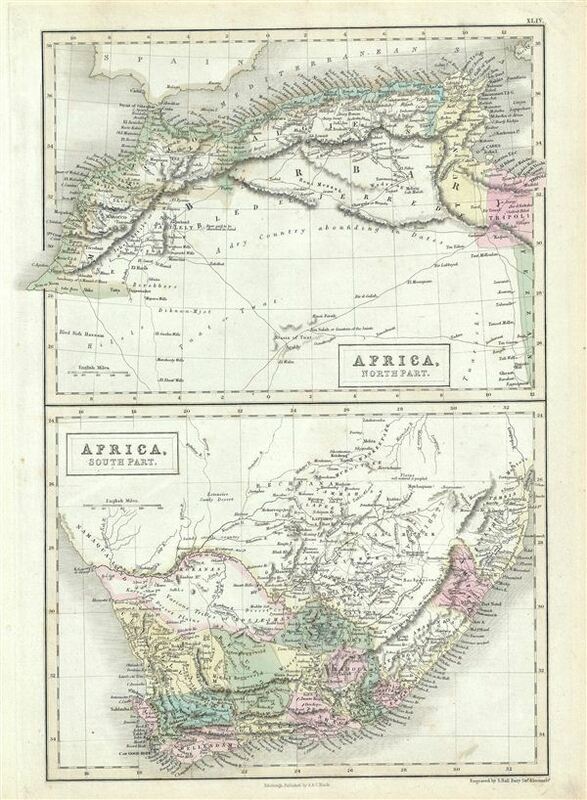 This is a fine example of Adam and Charles Black's 1851 map of Africa, northern and southern parts. Divided into two parts, the upper map is of the Barbary Coast and covers the western Mediterranean Coast of Africa from Morocco to Tripoli, including modern day Morocco, Algeria, Tunisia and Libya. The lower map covers modern day South Africa and includes the cities and towns of Clanwilliam, Beaufort, Worchester, Cape Town, George, Uitenhage, Stellenbosch, Somerset and Graaff-Reinet. The map of North Africa depicts the Tuat, a vast desert region, marked with numerous oases. The desert area is largely unmapped, simply identified as 'A dry Country abounding in Dates.' The map of South Africa depicts the regions of the various Bushmen (Bosjesmans) tribes. The 'Orange River Sovereignty,' which existed ephemerally from 1848 to 1854 between the Orange and Vaal Rivers, is identified. Various cities, towns, oases, rivers, deserts, mountains and several other topographical details are marked with relief shown in hachures. This map was engraved by Sidney Hall and issued as plate no. XLIV in the 1851 edition of Black's General Atlas of the World.